Since her studies at Biskops-Arnö College of Writing text, language and the act of writing have become an essential part of Emma Hammarén’s artistic practice. 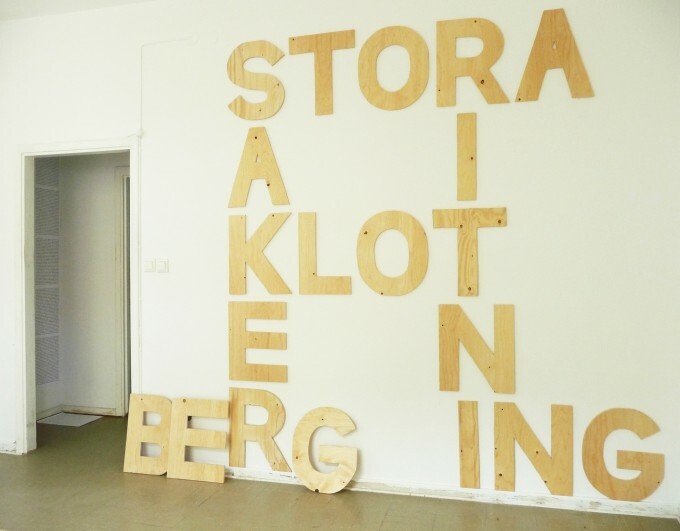 For her show at Provrummet Hammarén has created the new installation STORA SAKER which is presented together with the on-going work It Will Happen. The letters in STORA SAKER spell out some seriously big topics for us. The mightiness of the words in is highlighted as the words appear in a physical, tactile form taking over the space. 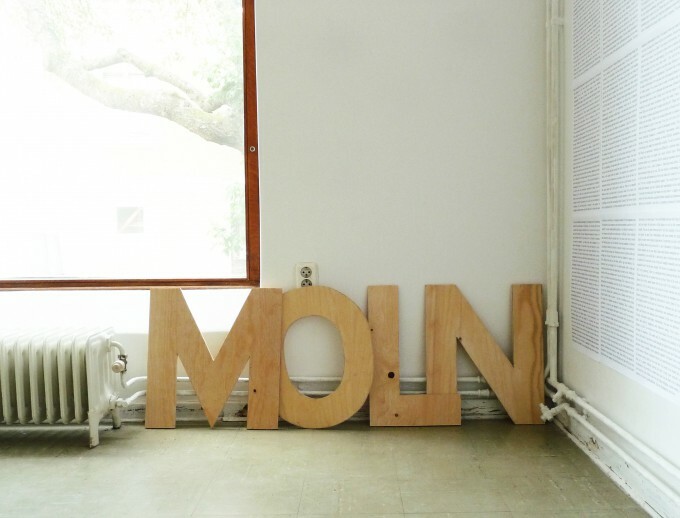 Hammarén has created the installation by using letters from her earlier plywood installations. Instead of writing the text and manufacturing the letters in advance, as she usually does, she has found the big words in her existing material. The words are found, the letters recycled, the earlier sentences opened up, the installation re-invented. 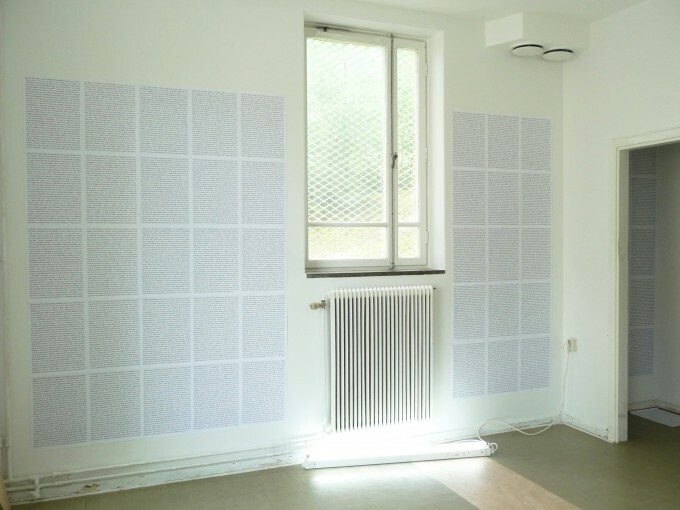 In Hammarén’s works text functions as material. The works are based on either her own texts or on found ones. In her recent work the words have received a physical existence also in materials such as foam, plywood and plastic. 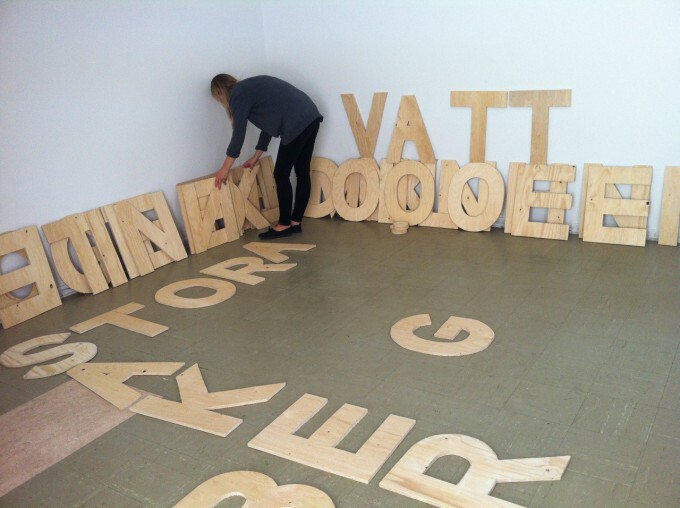 At Provrummet the physicality of the big words is contrasted in the flow of text of the work It Will Happen (2011 –). In the on-going work, Hammarén has collected her daily horoscope from the Italian Vogue magazine. The poetic yet often puzzling promises of the horoscopes become tragic as the text appears as an on-going preparation and anticipation for things to come, life to begin, love to be found, career to blossom. Contrasted with the never-ending flow of the encouraging promises are the simultaneously abstract and concrete big words facing from the opposite walls. Indeed, Hammarén’s works embrace a kind of unity between harshness and brutality, subtleness and delicateness. Words become part of a play, which is at the same time humorous and serious, poetic and prosaic. Hammarén’s work with text reminds of a research looking for its form. Installations seen at Provrummet are experiments on the existing material of the artist. As part of the show Hammarén has also curated a reading session dealing with big issues, which takes place at the opening of the show. The words appearing in STORA SAKER are taken from a text written by Hammarén, which she presents as part of the reading. Provrummet is a series of events and exhibitions that take place at Cigarrvägen 13 during 2013. Provrummet is a space for testing ideas, thoughts and collaborations. It investigates artistic processes and treats exhibiting work as a waypoint in a process rather than as a closure for it. Provrummet is curated by Elina Suoyrjö. 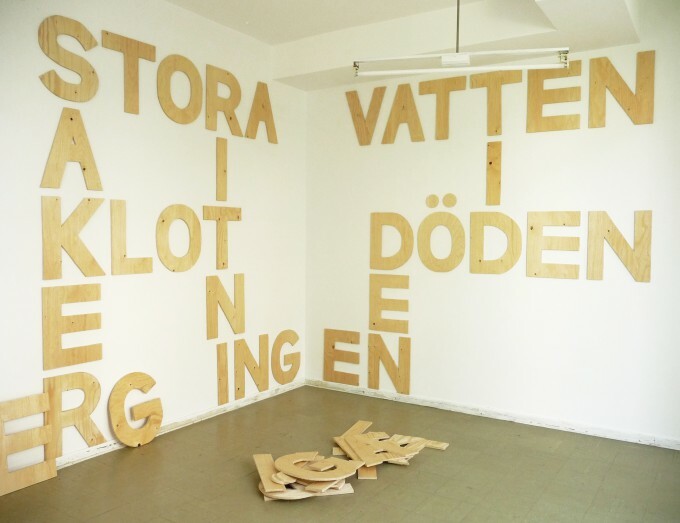 Cigarrvägen 13 is a 30 sqm artist run space set up by the artists Ami Kohara, Frida Krohn, Hans Carlsson, Johan Wahlgren, Savas Boyraz, Sebastien Berthier and Ylva Trapp. From 2013 onwards they have handed over the space to artists. They want to offer the possibility to realize a project or an exhibition, to arrange meetings, screenings, conversations or other public events.